I’m not exactly sure how to go about this review because poetry is not exactly something I read often (at all, really), nor do I know much about it, so everything here will be coming from a place of very little knowledge. So then why did I choose to read this collection of poems? Because I had an itch to try something not really in my comfort zone, you know, branch out to some new forms and see how it goes. And why John Keats? Well you see, I absolutely adore Ben Whishaw and was watching Bright Star wherein he plays Keats again, and thought hey! I don’t know that I’m actually familiar with Keats’ work as a poet at all? And so, here we are. 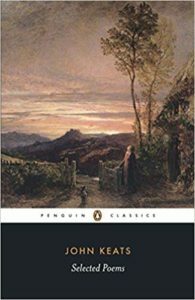 Selected Poems includes a large selection of works from John Keats, from his longer, well-known volumes such as Endymion, to some shorter little verses –some of which he did not publish himself—often written for or in honor of a specific person. Overall there is a large focus on nature and beauty, and from what I can tell, the verses seem to flutter on in a pretty musical fashion. I will admit that in some of the longer poem or books, I would be able to follow the first line or two of each paragraph/verse, but then begin to get swamped in the words and flow and lose the plot as they say before each verse was up. Though I did, however, find a favourite in Keats’s more well-known romance, Lamia, following a myth of Hermes/Mercury and serpent-woman Lamia. Truth be told, this was maybe a little more than I anticipated when I jumped into it, and I did find myself getting bogged down throughout the second-half of the book of poems, as my attention started to wander through all the poetic verses with which I am not super familiar. There is clearly a beauty to these words and for those that I could actually follow, I did enjoy, though I think maybe I need to get a little bit more into poetry reading before I can make any more eloquent judgments or critiques of it. This was an interesting little exercise for me, to say the least. Share the post "Truth Be Told I Don’t Know How to Review Poetry…"
What a cool way to branch out! I feel like I haven’t read poetry since high school English class, which is too bad. I’m sure I’ll be at least as lost as you if I pick this up, but I am right there with you on Ben Whishaw being a solid motivator.